You can submit abstracts here latest by 30 June 2013. 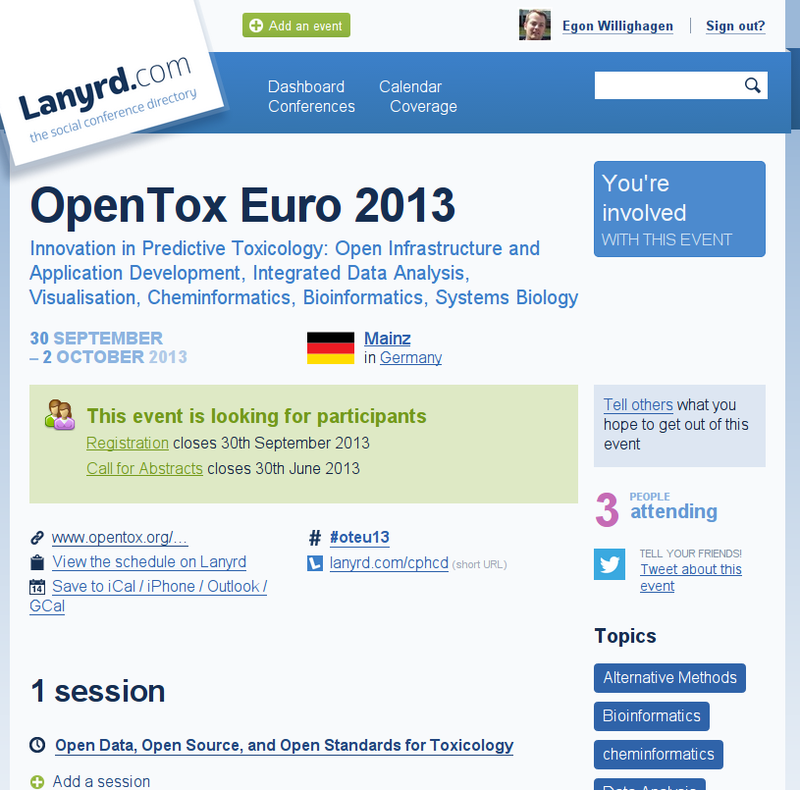 There will be sessions around these optics: Open Infrastructure and Application Development, Integrated Data Analysis, Visualisation, Cheminformatics, Bioinformatics, and Systems Biology. 2. Author details: Author "...@maastrichtuniversity.nl" provided in the manuscript differs from the one reflected in the submission system which is "..@gmail.com". We have proceeded and followed the manuscript. Please check and advise if action taken is appropriate. Yes, that is both me. 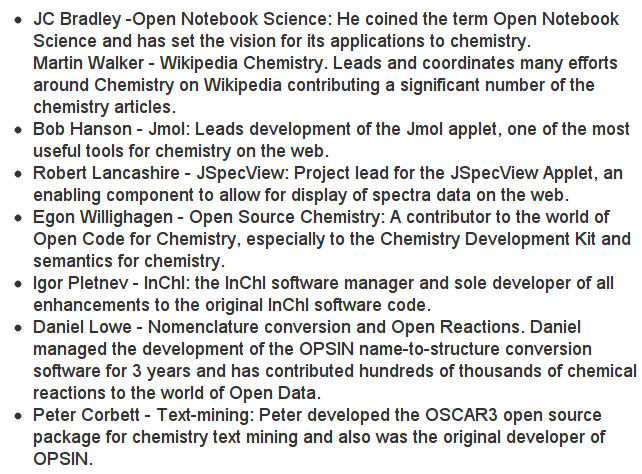 #ACSNola talk: "An architecture for an Open Science molecular compound database"
This is of critical importance to do reasoning over data in multiple data sets, as recently outlined in our Applications of the InChI paper, or for large data integration projects like Open PHACTS. By no means this architecture expected to be as functional as Open PHACTS or to replace large compound databases like ChemSpider or PubChem. Instead, it is meant as a simple architecture that does two things right and is simple enough to set up, that any chemistry lab can do it. 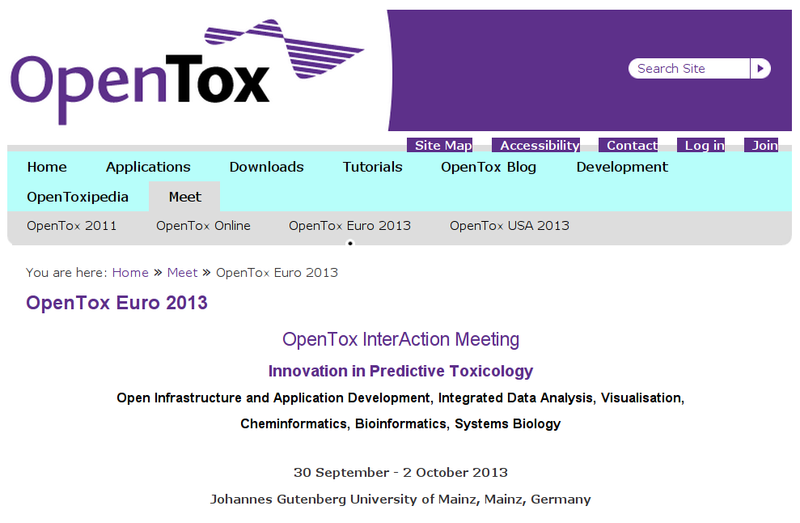 Goal: to increase the size of the chemical Linked Open Data network, which is way too small at this moment. 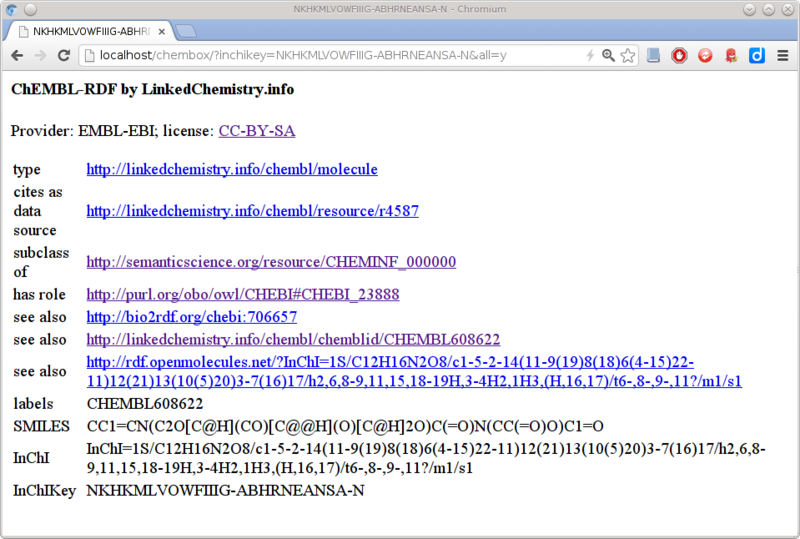 I will list LinkedChemistry.info data sets with DataHub.io. 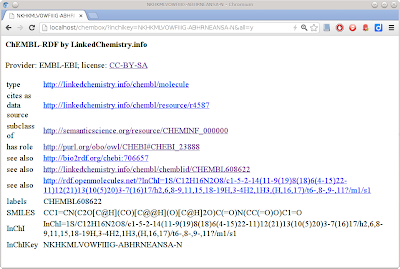 Basically, you set up a SPARQL endpoint with the data you want to share and the Chemical Compound Box as PHP front end using ARC2. That's it. 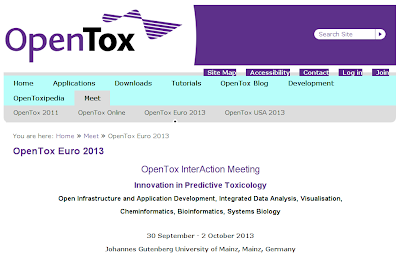 #ACSNola talk: "Bioclipse-OpenTox: interactive predictive toxicology"
Update: John May is now John Mayfield, see also his ORCID profile. After years of being release manager, John May (from Chris' group) has started as release manager for the 'master' branch, and thus leading to CDK 1.5.x versions (and later 1.6.x). This role of gatekeeper is very practical and comes with a large responsibility: ensure that whatever it pushed actually compiles for everyone. 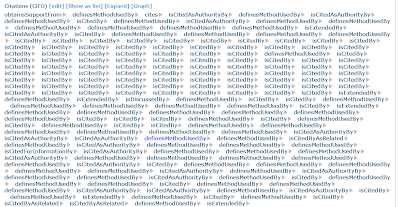 The gatekeeper will get up in the middle of the night when the official repository's branches does not compile! No, but really, really close to that. 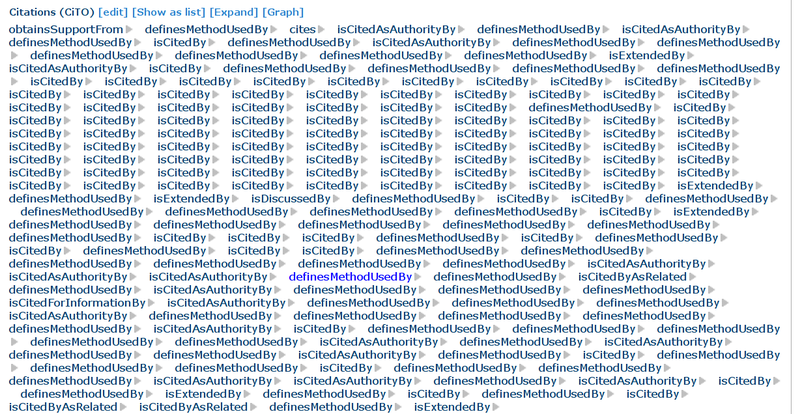 It's has main priority, so we always double check with 'git clean dist-all test-dist-all' before we push. No, we actually now and then forget to do this, e.g. after porting patches from another branch. But we fix that immediately! Promised! #ACSNola talk: "Open PHACTS: meaningful linking of preclinical drug discovery knowledge"
Also note the associate partnership program: it is not too late to join the 40 other associate partners and team up with Open PHACTS! #ACSNola talk: "Correlating time spent on exercises with exam results in Protein Structure education"
I have cleaned up the slides a bit, adding some information I explained during the talk in New Orleans. I'm a proud "RSC eScience hero"
A while ago Antony Williams, of ChemSpider, was awarded an eScience price for his work in the field. He decided to put that money to use to award several people. He worked things out with the Royal Society of Chemistry who send out a press release a few days ago ("RSC eScience heroes rewarded through Microsoft prize"). And I am proud to be one of those. Enormous thanks to Tony for this and congrats too to the other winners. I note that several of the winners are or have been involved in the Blue Obelisk movement, and seeing all the hard work rewarded by this prize indicates we are making impact. 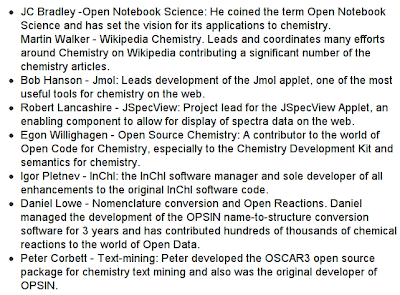 Personally, I am awarded for my work on the CDK particularly (but have worked on way more open source code for cheminformatics and statistics). I do stress that the CDK is a community project which I happen to be a long time contributor and founder of. 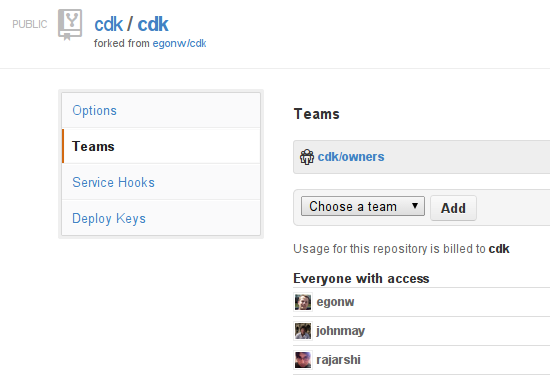 But the success of the CDK is based on the effort from all authors and users!